ONE ENDURANCE SPORTS IGIFTBAG DOES NOT FIT ALL! AN IGIFTBAG FOR EVERY TYPE OF EVENT. We’ve designed specialty igiftbags for every type of endurance sports event, filled with targeted gifts, expert training and nutrition content, revenue share deals and promotion options just for your sport. Your event participants DO NOT want a virtual reproduction of a physical goodie bag. They want something different and more engaging. Only an igiftbag leverages the power of gifts to raise the virtual goodie bag to a higher level level of sponsorship satisfaction and participant engagement. SHOWCASE EVENT PRODUCTS, PERFORMERS, EXPERTS. Use an iGiftBag slot to showcase an important event promotion for your target audience. While you may want to sell most of your iGiftBag slots to sponsors, you can also use slots to promote an event product, an expo booth, expert, performer or event happening. 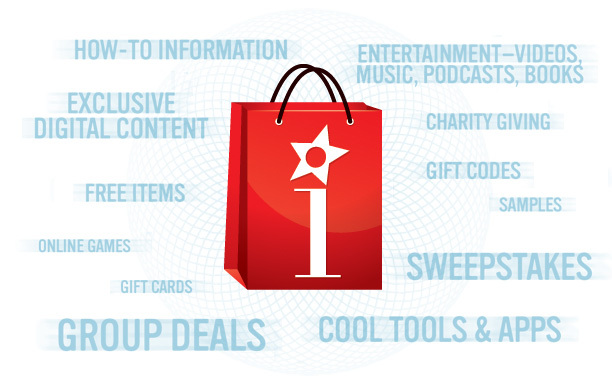 It’s easy to integrate the igiftbag seamlessly into your sponsorship sales activities. You can setup a sponsorship sales website invitation in a minutes to promote your igiftbag to all of your sponsors and enable them to learn about the igiftbag’s features and benefits, highlight key information about the sponsorship rates you elect to charge, and provide the online tools for them to instantly create their gift offer. You don’t have to rely just on your local or national sponsors to create great gifts. Every igiftbag can be fully loaded with “wrapped” gifts from our Gifts Catalogues from leading endurance sports brands and media partners (discounts, deals, PDF expert tips, book downloads, expert videos, Mp3s). THERE’S AN IGIFTBAG FOR EVERY ENDURANCE SPORT EVENT:. Perfect for: Race events. Charities. Event training programs and groups. Clubs. Monthly and quarterly gear gifts updates.